The Park World Excellence Awards reached its peak on Wednesday 26 September, as professionals from across the theme park and attractions industry gathered for a dazzling evening of celebration in recognition of the sector’s premier talents at the W Amsterdam. Launched in May of this year by Datateam Business Media in association with Park World magazine, the Park World Excellence Awards has been cited as ‘an awards scheme with a difference’, allowing Europe’s very best operators, suppliers, manufacturers and entertainment specialists to not only put themselves in the running for an award, but also nominate other outstanding companies for an accolade. The reins were then handed over to leading British comedian Ian Moore, who commenced the awards presentation. The first accolade, ‘Large Theme Park of the Year’, was presented to Efteling – who would later return to the stage to pick up a second award as Winter Efteling was honoured as the ‘Seasonal Event of the Year’. Paultons Park, home of Peppa Pig World, was then honoured with the title of Family Park of the Year, followed by Siam Park being presented with the award for Waterpark of the Year. Puy du Fou picked up the Live Entertainment of the Year accolade for Le Mystère de La Pérouse, while Bollinger & Mabillard was presented with the Roller Coaster of the Year award for Valkyria at Lisberg. Thrill Ride of the Year was awarded to Technical Park for the Squadron 33 at Dennlys Park; Alterface, Jora Vision and ETF picked up the Family Ride of the Year accolade for Bazyliszek at Legendia and Water Ride of the Year was presented to Intamin for Speed at Energylandia. weigand.maelzer was next on to the stage to collect the Waterpark Attraction of the Year award for the virtual reality waterslide which can be found at Therme Erding. 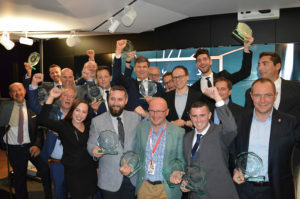 Vekoma, Brogent and Leisure Expert Group were then presented with the title of Media-Based Attraction of the Year for This Is Holland in Amsterdam. Themed Attraction of the Year was presented to Holovis, Scruffy Dog and Merlin Magic Maknig for Wicker Man at Alton Towers Resort, while Omnico took home the award for Best Ticketing & Access Control Product for its cloud based POS and customer engagement technology. The penultimate accolade, Best Use of Technology, was awarded to ETF Ride Systems for its trackless ride vehicles, used for the Basiliszek Dark Ride at Legendia. The awards presentation concluded with the coveted Industry Icon award which was bestowed upon Hubert Gerstlauer, founder of Gerstlauer Amusement Rides GmbH. The Park World Excellence Awards ceremony also provided guests with an opportunity to give back, in the form of a charity fundraiser in aid of Make-A-Wish Netherlands, a charity nominated by sponsor ProSlide, that is dedicated to empowering children aged 3-18 with critical illnesses by making their wishes a reality. Guests gave generously, with the full amount raised to be announced in due course. Following the success of the inaugural Park World Excellence Awards, the organisers are keen to extend their thanks to the sponsors who contributed to the event: Bertazzon, MACK Rides, Polin Waterparks, ProSlide, wiegand.maelzer and Semnox. Sponsor line-up grows with wiegand.maelzer	Celebrations & donations!